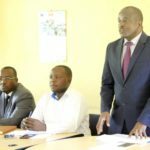 The Ministry of Public Service has rooted to establish One-Stop Centres across the country with the aim of improving service delivery to the citizenry. In a project dubbed “Service Uganda Project”, the Ministry is set to open three (3) One-Stop Centres/Service Halls in Entebbe, Jinja and Kasese Municipalities where the concept is to be piloted. To fast track this project, The Ministry has partnered with the Government of the Republic of Estonia to provide technical support in the establishment of this concept using the Tallinn City Model. 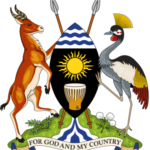 Between 19th and 28th March 2017, the Ministry of Public Service hosted a mission from Estonia who have implemented the One-Stop Centre concept for the last 18 years to share their experiences and offer guidance on the operationalization of the same in Uganda. 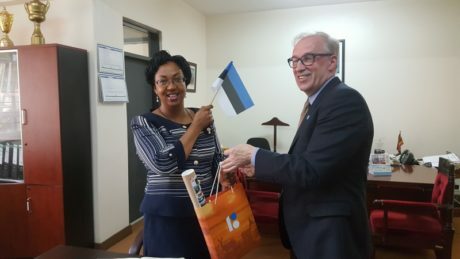 During the mission, the Estonian team met with officials of the Ministry of Public Service including the Permanent Secretary with whom a Memorandum of Understanding between the Government of Uganda and the Government of the Republic of Estonia was signed for the cooperation. Visits to the three Municipalities were done during which discussions on the concept were done. During the interactions, areas of support were identified and trainings were conducted to sensitize the Ministry and Municipal officials on the concept of one-stop centers and how to operationalize them. The purpose of the One-stop Centres is to provide important services at a single location and to save time for both the client and the government officials. The idea is that citizens would no longer have to sit behind doors of officials to find solutions to the problems since they will be able to get assistance that they need at the very first point of call of the government facility. It is intended that the one-stop centre will provide information on government services in which case a client would not be required to move from one office facility to another on the same issue. To kick start this concept, the Ministry of Public Service has established a mini One-stop center at the Ministry Headquarters to better serve its clients and improve service delivery. It is expected that there will be some redesigning of the area where this centre has been established to suit the intended purpose.